I cook. Sometimes I use recipes and sometimes I don't. I've come up with some great one hit wonders. This page is to record those fantastic dishes and some other recipes that are family favorites. Alan's grandma, Ma Fann, was in her late 80's when we got married. We went to visit her in Mississippi a few times. She was a spry old lady, living by herself and taking care of herself. She entertained herself by sewing quilt tops out of whatever scraps she could get and watching her soap operas and game shows. It was nothing to hear her on the phone in the middle of the night, talking to one of her kids and relating family stories. She dipped snuff, supposedly from the time she was three or four years old. It was the kind that came in the little glasses with a tin lid. We used to have a lot of those little glasses. One time we went when Callye was a baby, just walking. Ma Fann was neat with her snuff habit. She would have an old Betty Crocker icing cup, you know, the plastic ones with a lid. She'd put a napkin in there then open the lid, spit, and put the lid back on. But Callye was sharp and watched her. It took a long time when we got back home to break her from stopping and spitting in the floor. When there were leftover biscuits Ma Fann would break them into pieces and cover them with milk. Then she'd add sugar and let the mixture set all day. Before she was ready to bake she'd put in a couple of eggs and maybe some vanilla. That's what she called Poor Man's Pudding. It's her version of bread pudding. I made it for breakfast this morning. Pour milk over crumbled biscuits in a glass baking dish. Add sugar. Stir if desired or let the mixture set. Ma Fann never put it in the refrigerator but I think I might. When you are ready, take out the dish and stir in one or two eggs. Mix well. Add vanilla and cinnamon and mix again. I think you could also add whatever you wanted at this point, raisins, nuts, chocolate chips, whatever you like. Bake in a 350 degree oven until a knife inserted in the middle comes out clean. Enjoy! I was pregnant with Ty. I was working every day at the middle school. I had a dream one night about buttermilk pie. I’d never had one and had never thought it sounded all that good. But the craving started! It was strong and I just had to have one of those pies. I didn’t know how to make one and didn’t really have the energy to try. The sweet elementary school secretary, who loved you when she loved you and was to be feared when she didn’t, knocked on the door one Saturday. We didn’t have many visitors. The kids ran to the door with me following behind them. It was Mrs. Chaffin! She had two, yes TWO buttermilk pies. For me! Somehow she’d heard I had this craving and baked me those pies. They were the best thing I’d tasted in a while! 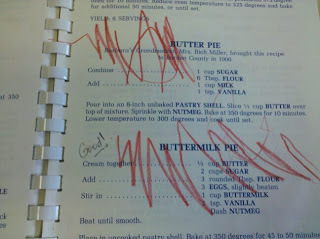 Since then I found a recipe I liked and I make a buttermilk pie every so often. At first the kids turned up their noses. I’ve fixed one for Christmas and for Thanksgiving as well. Nobody had tasted a buttermilk pie and who likes buttermilk anyway? But one taste and they were sold! Someone was helping Mamye cook! Cream butter and sugar together. Add the flour and the eggs. Stir in the buttermilk, vanilla and nutmeg. Beat til smooth. Place in an uncooked pie crust. Bake at 350 for 45 to 50 minutes or til a knife inserted in the middle comes out clean. Enjoy! When the kids were little the boys stayed with a lady named Sharon. They loved Sharon and she loved them. In fact, on the weekends half the time they called me Sharon. That doesn’t do much for a working mom’s psyche! But, because of how things are, I worked and was thankful they stayed with a loving caretaker. It’s funny how leftovers can come together sometimes and make something totally delicious! This tamale casserole was a recipe makeover that is really better than the real thing! One of the boys favorite things was something Sharon called Tamale Casserole. She would take a can of tamales, chop them into pieces, cover them with a can of mushroom soup and top the whole thing with cheese. Then she’d bake or microwave it until everything was bubbly, and that was lunch. It looked really ugly to me, but the boys loved it! I had some leftover homemade tamales in the refrigerator. They were really good but there was a dozen and a half to start with and we were getting tired of them. I also had some leftover roast and some green chili. I took the tamales, removed the cornhusks and cut them into four to six pieces each. I placed these in an oblong casserole dish. I added a can of mushroom soup. Growing up, mushroom soup was a staple. Almost everything tasted better with mushroom soup! I put the soup in a pan and warmed it up. I stirred in the leftover roast and the green chili. When it was all warm I added some Velveeta, (another staple when I grew up) and when it melted, poured the mixture over the tamales. I may never be able to replicate it but it was really good. Alan was skeptical when I said Tamale Casserole because he had visions of the dog-food like dish the kids adored. 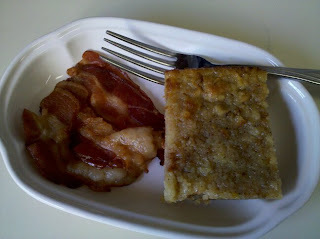 He tasted it and said, “This is not Tamale Casserole.” I explained what I did and he said write it down, it’s a keeper. I had a fried egg on top of mine. Tasty!!! Drain tamales if using canned. Unwrap and chop each tamale into 4 to 6 pieces. Place tamale pieces into a 9” baking dish. Pour canned mushroom soup over tamale pieces. Spread to cover all tamale pieces. Top with grated cheese. Place all in a preheated 350 degree oven. Bake until bubbly and cheese is melted. Can also be microwaved. Enjoy! I love fall. I love the colors. I love the smells. I love how it’s cool enough for a sweater but not cold enough for a jacket. Fall makes me want to cook. It doesn’t matter whether it’s a pot of soup or cookies or muffins baking in the oven. Nothing seems more welcoming than a warm muffin with a cup of coffee on a chilly morning. When I was little my mother would make bran muffins. My dad is a picky eater. He liked bran muffins so that’s what she made. She had a recipe for bran muffins that she liked. It used cereal called All Bran. I don’t even know if they still have All Bran. The cereal looked like little pellets to me and she would put the liquid in and let it sit for a while before she mixed the rest of the ingredients in. I don’t remember where I got the recipe for Raisin Bran Muffins. I thought they sounded good and would be similar to what mom used to make, except with raisins. I really doubt my dad would eat these! The thing I like best about these muffins is that you can mix up the batter and keep it in the refrigerator for up to 8 weeks. That means on any morning you can make that warm muffin to go with your coffee and get a good start on your day. Mix all ingredients together. Put in airtight container and put in refrigerator. 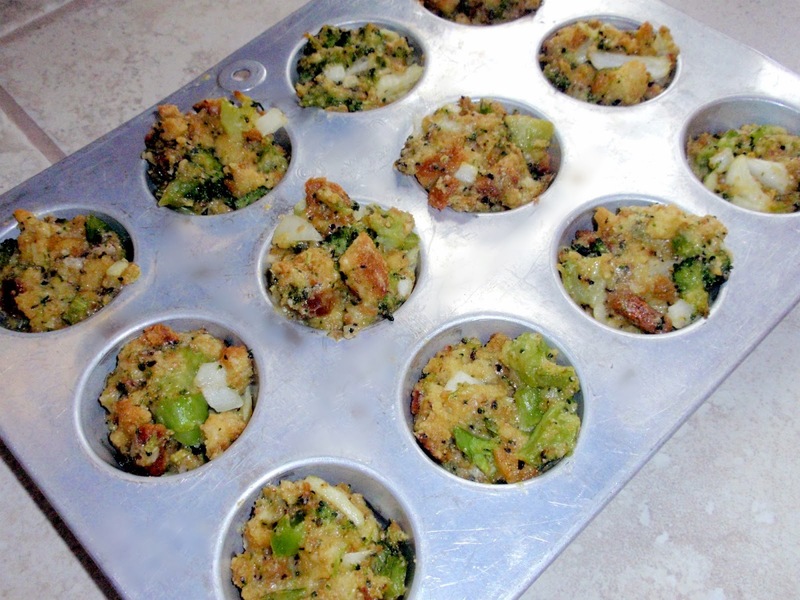 Take out what you need and put in muffin tins. Bake at 350 degrees for 10 to 12 minutes. This will keep 6 to 8 weeks in the refrigerator. Enjoy! I have a Blueberry Muffin recipe, which can be kept in the refrigerator, too. That’s another post! Sometimes there’s nothing that tastes better than good old spaghetti! Growing up, my mom always made meatballs. That was one of my dad’s eating things I guess. I don’t know if he didn’t like meat sauce or if he just preferred meatballs. When I would decide to have spaghetti it was usually in the search of something fast and easy. Meatballs weren’t fast or easy for me! I have two meat sauce recipes I really like. Both came from a little Hunt’s cookbook my mom gave me back in the 80’s. She loved to order the brand cookbooks! And I loved getting them. This sauce is quick, easy, and surprisingly good! It calls for ½ pound ground meat but I always added a pound and it didn’t seem to make any difference. It’s called Ten Minute Spaghetti and Meat Sauce. When I got hungry for spaghetti the other night I couldn’t find this recipe. I looked and looked. Finally I found the other one I liked. I fixed it and it was great. After we ate I looked on the shelf and what do you think I found? The recipe I was looking for to start with! Figures! I was skeptical when I saw that it called for brown sugar. The other one has sugar, but just a pinch. But three tablespoons seemed a lot. I followed directions though, except for the olive oil, and it’s good. For some reason red food and extra oil don’t mix well in my tummy, so I leave it out. This sauce is called Classic Spaghetti Meat Sauce. Cook beef with onion in large skillet over medium-high heat until beef is browned. Drain. Stir in tomato sauce, undrained tomatoes, oil and brown sugar; blend well. Simmer, covered, over medium-low heat for 15 minutes or until hot. Serve with spaghetti, if desired. I’m not much of a breakfast eater. That’s not to say I don’t like breakfast. I just am not a very capable breakfast cook. I can never get things to come out evenly. My friend Lynn had a bunch of people coming for the holidays and she told me about a great breakfast casserole she makes that’s easy and really good. It’s more like breakfast bread than a casserole. I tried it and everyone liked it! Everywhere I’ve taken it people ask for the recipe. It’s something the boys ask for when they come home. It’s easy and I don’t mind making it at all. Cut up the biscuits into cheese cube sized pieces. I use scissors to do this and it works really well. Mix the browned sausage, cheese, eggs and biscuits together. Pour into a greased bundt pan. Bake 40-45 minutes at 350 degrees. Cool, and remove from pan. Slice and enjoy! Cooler weather always makes me think of comfort food. I start thinking of warm, creamy things. I’m a soup eater. I like soup and I can make soup out of just about anything. And apparently, it’s good because people eat it! 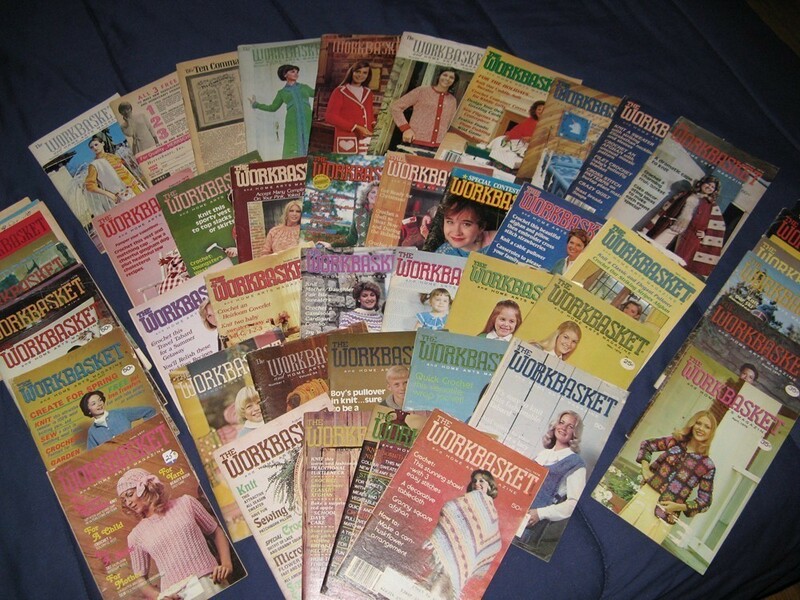 When I was growing up my mom used to get a magazine called The Workbasket. This little magazine was anywhere from 40 to 80 pages long. 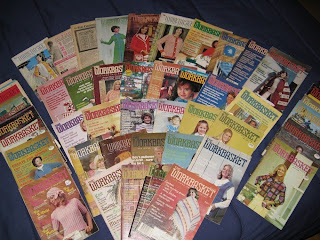 It had a color cover and was full of wonderful articles, recipes, advertisements and patterns. There were instructions for everything from doilies, to sweaters and scarves. There were sewing patterns and quilt patterns. There was knitting and crochet. It cost around .35 cents an issue and was worth every penny! Workbasket Magazine. Picture from Etsy. The recipes were especially good. They were plain food, economical and nutritious, designed for the homemaker to feed her family. When I got older she’d save the magazines for me to look through. One day, looking through a Workbasket, I found the recipe for Pork and Bean Soup. I don’t think they called it that but that’s what it was. I tried it and we liked it. The soup is easy and fairly quick to make. It can also be put in the crockpot to cook if you have to go somewhere. One family I know puts it in before church and when they come home lunch is just about ready! Slice sausage and place in medium large pan. Add chopped onion. Add potatoes. Add water, just to cover potatoes and cook on medium until potatoes are soft. Stir in one can of pork ‘n beans. If you like more beans add the other can. Cook on low until all is heated. Yummy! The little guys ate it up! 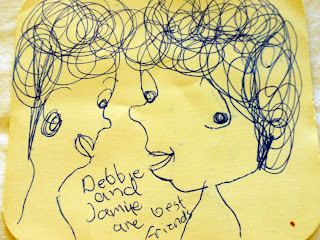 My friend Debbie is one of the dearest people I know. Everyone used to think we were sisters. I don’t know that we particularly looked alike but we were together a lot. We liked the same things and enjoyed each other’s company. Callye drew this years ago. Debbie moved to East Texas and I didn’t get to see her much. When we did happen to get together it was like we’d never been apart. We’d talk about family. We’d show each other the projects we’d made and discuss our great ideas. We’d exchange recipes on some delightful culinary concoction we’d run across. This Frito Pie was gleaned from one of the recipe exchanges. 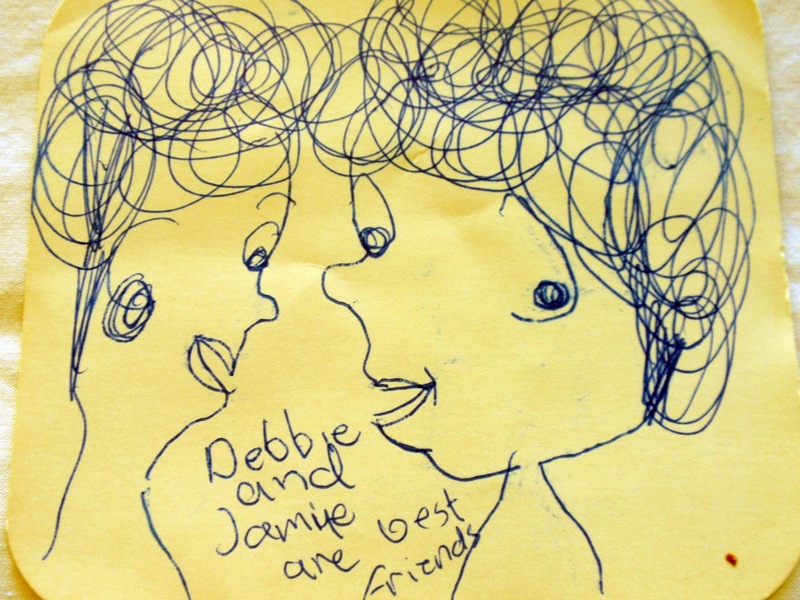 I haven’t seen Debbie in years. She’s moved from East Texas back to West Texas but is still three or four hours away. We haven’t kept in touch by phone or mail. I don’t even know if she has email. But I know when I do see her again it will be just like we’d never been apart. We’re kind of like a soap opera. There will be some little details but basically we’ll know what’s going on with each other. It’s great to have a friend like that. This can be made in the microwave or on top of the stove. Mix corn, beans and chili together in medium/large saucepan. Stir in grated cheese. Cook on medium heat until cheese is melted and mixture is heated through. If you are microwaving, mix all ingredients together in a microwave safe bowl. Cover bowl. Cook three minutes on medium high. Stir then turn bowl one quarter turn. Cook three more minutes on medium high. Repeat the process until the cheese is melted and mixture is heated through. Place Frito’s corn chips in a bowl or on a plate. Spoon chili mixture on top of Frito’s. Enjoy! When I went to college I lived in the sorority dorm. All of the girls were talking about the new cute boy with blonde hair and green eyes that hung out at the fraternity house across the street. I had to check it out for myself so I walked on over. He says it was love at first sight. I don’t know about that but I was impressed and curious about this cute boy. We ended up going out and dated for three years through college. About a month after graduation we got married and we’re still that way. That first year, I was trying to impress. His birthday was coming up so I wanted to make a special cake for him, one that my mom used to make. Everyone always loved it. It was a Chocolate Cherry cake. I think the original recipe was from a Pillsbury Bake-Off contest. It was a hit. Maybe he married me for my cooking! I don’t know, but it’s still a hit today. 1 package Devils Food Cake (I use any chocolate cake mix. I’ve used milk chocolate and German chocolate and it turned out fine. Preheat oven to 350°F. Spray a 15 x 10 x 1-inch baking pan or 13 x 9-inch pan with no-stick cooking spray. Combine all ingredients for cake in large bowl; stir until well blended. Pour into prepared pan. Bake until a toothpick inserted in center comes out clean. For 15 x 10 x 1-inch pan, bake about 20 to 30 minutes; for 13 x 9-inch pan, bake about 25 to 35 minutes. The original recipe has a frosting recipe that uses chocolate chips. I have a frosting recipe I like to use. When I used to visit my mamaw, she would give me little ‘prizes’. Most times it wasn’t much, but it was the thought that counted and I felt loved. One time she had a Hershey Cocoa Cookbook. Most likely it was a freebie with the purchase of the cocoa. She gave it to me. I’ve come to cherish things like that, small as they may seem. Inside there is a frosting recipe that’s great. I like it because it can be adjusted to be as ‘chocolaty’ as you want. Melt butter in saucepan over medium heat. Add amount of cocoa for flavor you want. Heat just until mixture begins to boil, stirring constantly until smooth. Pour into small mixer bowl. Cool completely. Add powdered sugar alternately with milk, beating to spreading consistency. Blend in vanilla. One cup frosts an 8-9 inch square or round cake or pan of brownies, or the top of a 13x9x2 inch cake or pan of brownies. Two cups fills and frosts an 8 or 9 inch two layer cake or 30 cupcakes. Top the Chocolate Cherry Cake with the Fudge Frosting. Guaranteed delicious! My mom, and her mom too, were not afraid to try a recipe from the back of a box. Many of my mom’s favorite cakes came from the back of a cake box. She’d try something that sounded good whether it was on a box, can or label. Because of that I’m always on the lookout for something different. One of our favorite ‘quick’ breakfasts was a can of cinnamon or orange rolls. It was a treat to wake up to the spicy smell of the bread baking, even though it was not from scratch. It was and still is one of my dad’s favorites! When I saw a recipe using biscuits and orange marmalade, I decided to try it. I thought it might be a little like the famous orange rolls everyone was so fond of. Orange marmalade might be an acquired taste. I like it. I found some at the Dollar Store, but it doesn't have much orange peel in it. I think the jar said there was only 12% peel. Next time I'll get it at the grocery store. 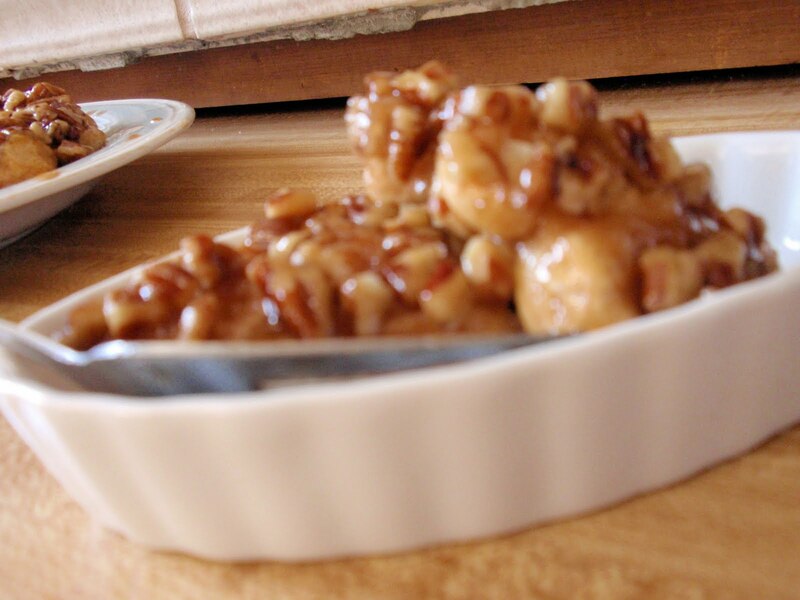 I’ve adjusted the recipe through the years, to suit my tastes and now it’s a family favorite. It was originally printed on the side of a can of Pillsbury biscuits. I don’t even know if they put recipes on biscuit cans now, but I’m glad they used to because this one is a keeper! Preheat oven to 375 degrees. Grease a round, 8 inch pie pan. Sprinkle nuts evenly on the bottom. Open biscuits and cut each biscuit into at least four pieces. I use kitchen scissors for this and it’s quite easy. Drop the biscuits into the pie pan on top of the nuts. Make sure they are spread evenly in a flat layer. Cutting biscuits is so easy! Combine the marmalade, honey and butter or margarine in a small saucepan. Cook and stir until the butter or margarine is melted. Spoon the melted mixture evenly over the biscuits. Bake for 20 to 25 minutes or until the biscuits are brown. Remove from oven and cool for about 2 minutes. Invert on serving platter. Enjoy! All Betty Crocker cookbooks are not the same! I found that out, early in my married life, when I was looking through my wedding present cookbook for a favorite recipe of my mom’s. It was in her cookbook. It wasn’t in mine! Hers was a loose-leaf binder with tabs. Mine was a hardback, more like a book. She got married in 1956. I don’t know the publish date in her book. In mine, it’s 1978. I copied down some of the recipes I liked and they are on faded index cards, in a box (when I remember to put them where they go!). 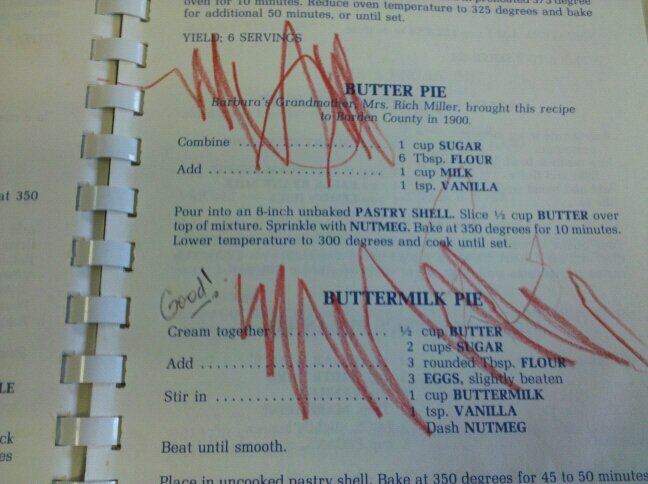 Recently I received a copy of a Betty Crocker cookbook that had belonged to my husband’s grandmother. It’s a hardback, like mine. There’s an inscription in the front stating the book was given to her for all of the great family business and the friendship throughout the years. The copyright in that book is 1950. It has a lot of the recipes my mom used. I’m lucky to have it. I don’t always use a cook book, and when I do, it’s sometimes just a starting place and I’ll tweak the recipe to make it my own. But there are some things, comfort foods that remind you of good times, family times and growing up. This is one of those recipes. Pork and beans are not a favorite food of mine. But when my mom ‘doctored’ them, and they became ‘baked’ beans, it was a different story! Here’s her (and Betty Crocker’s) secret! I don’t know if baked beans with pork is the same as pork and beans or not, but that’s what we always used. Also, I put in a tablespoon or two of brown sugar, as well. Just for good measure! Enjoy! My mom always got us the cookbooks from the back of the box or magazine offers. I’m not complaining! They are usually pretty good! I don’t remember when, but once she gave me a Kraft cookbook. It was called “Good Food Ideas, Kraft Cheese Cookbook”. It’s a paperback and I’ve used mine so much it has to be held together with a rubber band. I’m sure now a lot of these recipes might be online. Maybe. Some of them are pretty old! A favorite of ours is a chicken spaghetti that they call “Harvest Casserole”. It’s one of those quick, easy things and the family loves it. I think they like it because Velveeta cheese is involved! It starts with a ready-made mix. I’ve wondered what would happen if they didn’t make that mix ever again. I think the mix could be replaced either with a package of dry spaghetti mix or even a jar. Of course, you could also sub with your own homemade sauce too! Cook spaghetti: drain. Saute green pepper in butter or margarine. Stire in tomatoes, water, The Herb Spice Mix and The Grated Parmesan Cheese. (These are the little envelopes inside the spaghetti box. I guess that’s why they are capitalized!) Add spaghetti, chicken and ½ pound Velveeta, cubed. Mix well. Pour into a 2-quart casserole. Bake at 350 degrees for about 25 minutes. Top with additional process cheese spread slices; continue baking until cheese melts. Makes 6 to 8 servings. Can't go wrong with Velveeta! The good thing about this is you can change it up. Add mushrooms if that’s what you like. Or put in some green chili for an Italian Mexican flavor. Also, you can make it ahead of time and refrigerate. Then you’d cook it at 350 for about 40 minutes or until it was heated through and the cheese melted. It works in the microwave too. I’ve never tried it in the crockpot,. It might work I guess. Like my mother, I look at recipes on the backs of boxes or cans. If they sound good, I’ll cut them out and file them away. Some I eventually try and some I know I’ll never get to. Either they don’t sound good anymore, because my tastes have changed or they are too much work or I just don’t want too! Date nut balls is one of those recipes. It was on the back of a Kellogg’s Rice Krispie box, years ago. My mom saved it and made a batch once. Once was all it took! They were great and became a favorite. Original recipe...right off the back of the box! Dates aren’t always a first choice for people. They are ranked right up there with figs and prunes and raisins! Someone asked me what a date tastes like. Well, a date tastes like…a date! They are sweet, with a texture kind of like a raisin. I’ve had people tell me they taste like chocolate and also that they taste nutty. I don’t get either of those tastes out of a date. They just taste like dates! There’s a funny family story related to Date Nut Balls. If saying Nut and Balls in the same sentence doesn’t bring a laugh (from your kids, or your inner seventh grade self) then this story probably will. 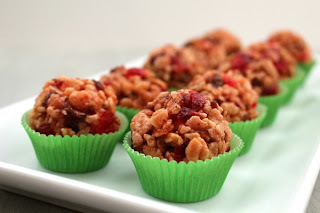 My kids love date nut balls. One Christmas my daughter decided to make a batch for her brother. As a joke she made a giant one and handed it to him. One look (and one bite later) he said, “Holy crap, these are good!” Well, you know any word that shouldn’t be said is the first word a little one hears. A while later one of the littles came in and asked his mom for some Holy Crap. First, she couldn’t imagine where a two year old had picked that up and second, what the heck did he want? It took a while but finally everyone figured out he was talking about the date nut balls his uncle had exclaimed over. So secretly, and only in the family (I think!) we refer to these as Holy Crap! Give these a try! 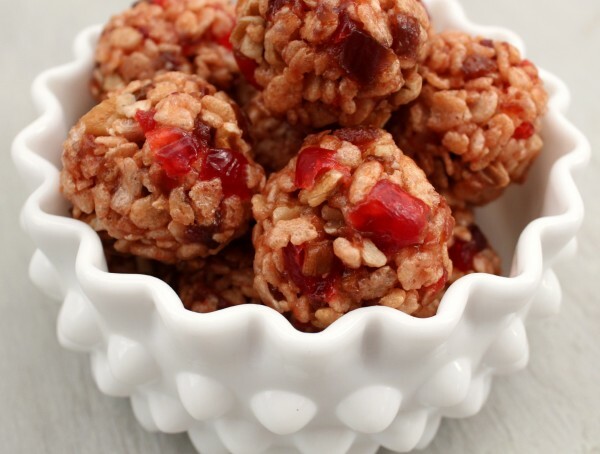 Date phobia or not, I guarantee that once you taste these you will love them! Measure margarine, dates, cherries and sugar into medium-size pan. Cook over medium heat, stirring constantly until mixture becomes a soft paste. Remove from heat. Add cereal and pecans. Mix thoroughly. Portion by level measuring tablespoon onto waxed paper or buttered baking sheet. Shape into balls Let stand until cool. Makes about 3 1/3 dozen These are pretty and great anytime. We always make some for Christmas and they have become somewhat of a tradition. Enjoy! They are yummy! A friend of mine on a knitting list I’m on, mentioned that she made Broccoli Balls for Thanksgiving for her kids. She said the boys loved it. She posted the recipe and I thought I’d give it a try. My son in law, Bernie, doesn’t eat eggs. Even the thought of an egg makes him shudder! He’s not terribly fond of broccoli either. But, he loves Broccoli Balls! He’ll eat them by the dozen! I don’t mind making them for him one bit. But making the balls isn’t my favorite thing. It takes a long time and I have this thing about washing my hands. I wash them too much. So, I’ll dip in the bowl, grab a bunch and make a ball or two then I have to wash my hands. As soon as that happens I plunge my nice clean hands right back in and make a few more balls. 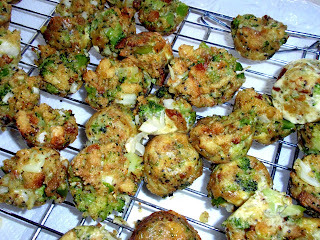 One year when Callye was helping make them we had a broccoli ball epiphany! She pulls out her mini muffin pan, a really cool one that has 48 holes, and voila! Broccoli ball muffins are born! A mini muffin pan...perfect size! Seriously, they are just the right size, pop out perfectly and are a whole lot easier than those little balls! If you really wanted to, you could put in mini muffin liners I suppose, but we just make them bare panned. Preheat oven to 325. Cook broccoli according to pkg. directions. Drain well and let cool. Mix remaining ingredients and broccoli together. Shape mixture into 3/4 inch balls and place on cookie sheets. Bake for 15 to 20 minutes. Makes 6 or so dozen in the muffin pan and more if you choose to roll into balls. They can be frozen and enjoyed later but I’ve never had the chance to freeze them as they are all gone very soon! If you do choose to be efficient and have them made ahead, thaw slightly before reheating. Eat them up! Quick! They disappear fast! I sure like my mom. I think I don't tell her enough. She was good to us. Funny thing is, I can tell where each recipe was prepared. I know my dinnerware. I am eagerly awaiting cheesesteak...those cool little crescent rolls you made with mushrooms and cream cheese, and the bacon spaghetti sauce! My printer is busy printing the whole post! These seem easy enough for even a non-cook like me! Thanks Robbin! I wish there was a way to alphabetize or link to them or something to organize better. But there's not on a second page in Blogger. Maybe someday! This blog made me smile the whole way through from the snuff dipping Grandma to Holy Crap! haha My great-great grandmother dipped snuff and spit into a glass noxema jar with a tin lid. She wiped the corners of her mouth with a lacy, embroidered handkerchief! I love your raisin bran muffin recipe this time of year! I would love to have your blueberry one! I love your Raisin Bran muffin recipe in the refrigerator this time of year! I would really love your blueberry muffin recipe!